MTSU Faculty Woodwind Quartet ..
MTSU alumnus returns to discus..
MTSU students and alumni seeking internships, a first job or a steppingstone in their careers are encouraged to dress to impress and attend Wednesday’s career fair hosted by the Career Development Center of Middle Tennessee State University. 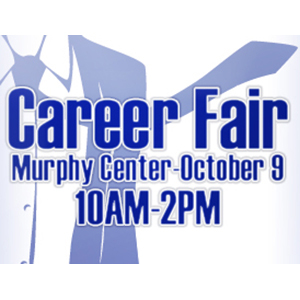 Reserved for MTSU students and alumni, the Fall Career Fair will be held from 10 a.m. to 2 p.m. Wednesday, Oct. 9, at MTSU’s Murphy Center on the track level. It’s the university’s largest on-campus fair of the year, and more than 100 employers and 1,000 students are expected to attend. Only current MTSU students or alumni may participate. Admission is free. Students should bring their student IDs to check in, while alumni without an MTSU ID can use a resume that shows their MTSU degree, major and graduation year. Find out more, including a list of employers and organizations attending the event, at www.mtsu.edu/career/fallfair.php. Dusty Doddridge, assistant director of the Career Development Center, said students and alumni should wear professional business attire and bring copies of their resumes for employers. Click on the graphic above for more information from the MTSU Career Development Center. A variety of businesses, industries and nonprofits — ranging from Aflac to Nissan to State Farm — will be hiring for internships, co-ops and entry-level positions, Doddridge said. He added that the fair is an opportunity for students to meet and network with potential employers in their fields. Graduate and professional schools also will be recruiting for their programs. MTSU’s Career Development Center is a comprehensive center that serves all students in each of the university’s eight colleges. Ingram Content Group and EFC Systems sponsor the Fall Career Fair. For more information about the 2013 Fall Career Fair at MTSU or the Career Development Center, call 615-898-2500 or visit www.mtsu.edu/career.